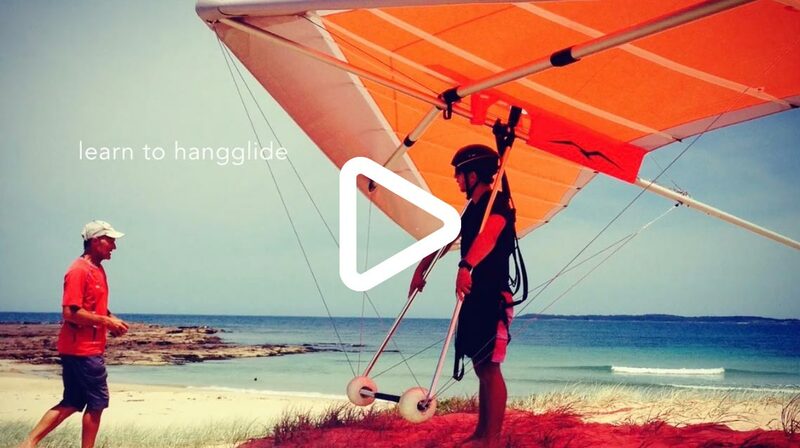 Learn to hang glide quickly without comprising on quality instruction with the team at HangglideOz. Novice hang gliding courses may take anywhere from 4-6 weeks. We have to consider a few factors; your availability, student skill and the weather. These factors dictate the length of each student's individual progression. Our hang gliding lessons commence with flights in a tandem hang glider, during which time you will learn the basic control movements used in hang gliding, pitch and roll. The hanggliding lessons will then move to small training hills located in the Wollongong area, where you will progress, with repetition, to ground skimming solo glides, always within reach of your instructor. Further tandem hang gliding instruction is required for correct technique in turns to 180 degrees. Once this skill has been mastered, you will return to training hills and progress from solo ground-skimming flights to higher glides, assisted by your instructor with use of UHF radios. Further flights with the tandem hang glider are used to facilitate soaring flights at Stanwell Park, traffic avoidance and landing approach. This is repeated until students are fully confident and comfortable with solo soaring flights. Solo soaring flights under instruction are mandatory prior to licence completion. Detailed theory lessons and the licence exam are also included. We recommend that our students are also available mid week to under go hang gliding training. It becomes difficult when students are only available weekends, on a few different levels. Our training sites tend to get quite busy during the weekends. Also if we happen to get a few weekends in a row with unsuitable weather conditions,we don't have continuity with instruction. In a nutshell it can be like one step forward and 2 steps backwards. Every hang gliding student will learn at their own individual pace. Therefore, course completion times will vary. As an indication, you will spend at least eight to ten flying days to reach licence level. Extra supervision with your instructor maybe needed if the required skill base has not been reached. Once students have attained their novice rating, your instructors will be available for advice at both the Stanwell Park and Hill 60 sites 12 months of the year, if required. HangglideOz is a member of the Hang gliding Federation of Australia and has been instructing students since 1987. The best time of the year to learn would be during the warmer months. We don't have access to our training sites in winter, due to the wind direction at this time of the year. Depending on the season, it could start as early as October, but on average we would recommend November/December through to March/April. Unfortunately we cannot train students during the winter months. We offer a 5% discount on any new equipment purchased and have Glider/harness/helmet packages available.